With three boys, you better believe I’ve heard “so when are you trying for your girl?” followed by a: *wink wink*, more than a few dozen times. It doesn’t bother me, or offend me, and I understand why people ask. And the truth is—we were on the fence so long about a third child, I had no idea if we would feel “done”. I knew for sure there was no way I’d ever have more than four kids, but I hadn’t fully shut the door on the potential of a fourth child. I didn’t have that resolute feeling that our family was “complete” as soon as Jonathan was born, like so many families say when they have their last baby. I was happy, loved the fact that we had another baby boy and I could proudly carry on the title of Exclusive Boy Mom. I didn’t feel certain one way or the other that we were done having kids or not. And then Jonathan was diagnosed with craniosynostosis. It’s a completely curable congenital condition that required surgery and 4 months of helmet therapy. 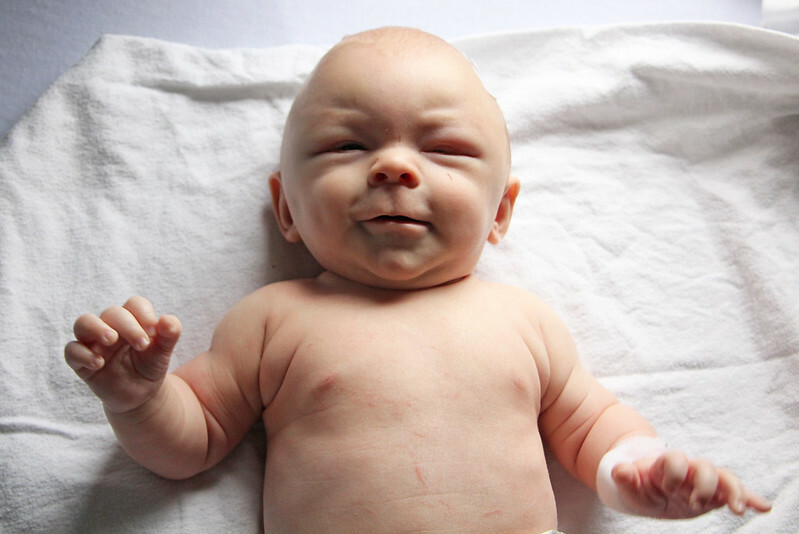 The most important thing was that our baby was healthy, which I think is what every family prays for, but it was a very overwhelming and serious thing to send our 11 week old baby for skull surgery, nonetheless. He did marvelously, recovered well and wore that helmet like a champ. There was no adjustment period for him to get used to the helmet, but there was a lot of driving for us—a 7 hour round-trip to Edmonton every 2 weeks for helmet appointments among harvest, school, hockey, skating and other things going on with the big brothers. It wasn’t solely the diagnosis and surgery that put me off any future kids, but it was definitely the first red flag moment that I had—I didn’t want to go through that all again, or worse. 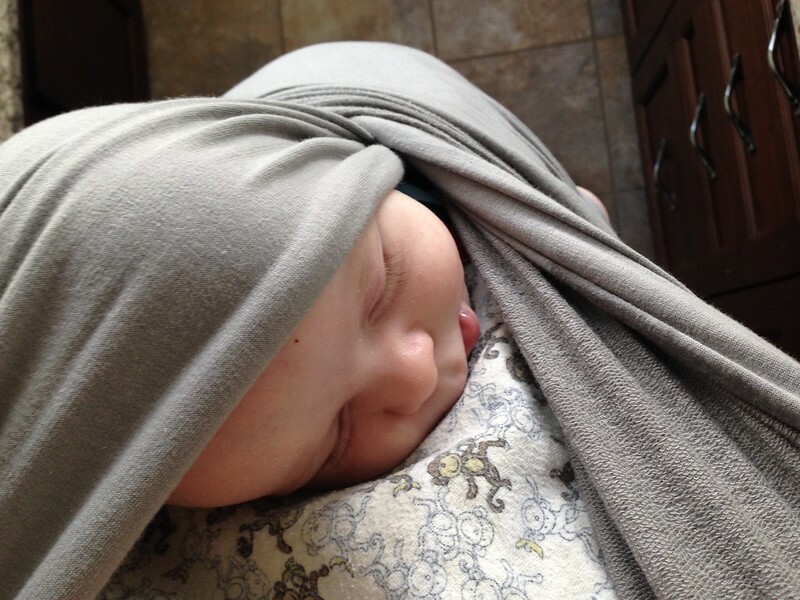 Another pivotal reason I knew we were done was the fact that Jonathan would.not.nap anywhere but in my arms, me wearing him in a wrap, or the car seat, from about 8 weeks old to over 4 months old. When I had my first two babies, who NEVER had issues having their naps in their cribs, I never would have believed such a thing could happen. Surely the mom whose baby “wouldn’t nap” just wanted to hold her baby and get those cuddles while she still could! Did she try a swing? A bouncer chair? Babies nap, it’s what they do! 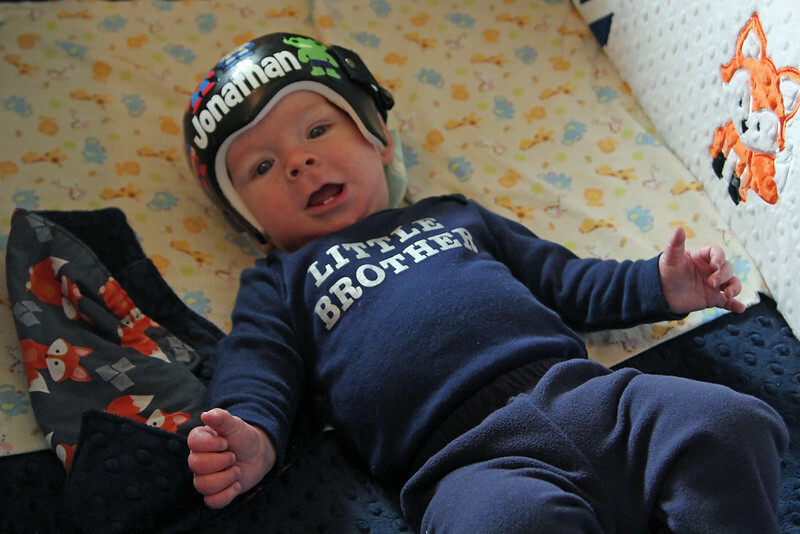 I vividly recall being at my mom’s for Jonathan’s second helmet appointment, which happened 2 weeks after he got it. I nursed Jonathan and walked around bouncing him, begging him to fall asleep, and he just wouldn’t give in. I tried the wrap, and he wouldn’t give in. Luckily he always slept through the night from a very early age, but getting him to sleep was still really hard, and even more so (understandably) after surgery. 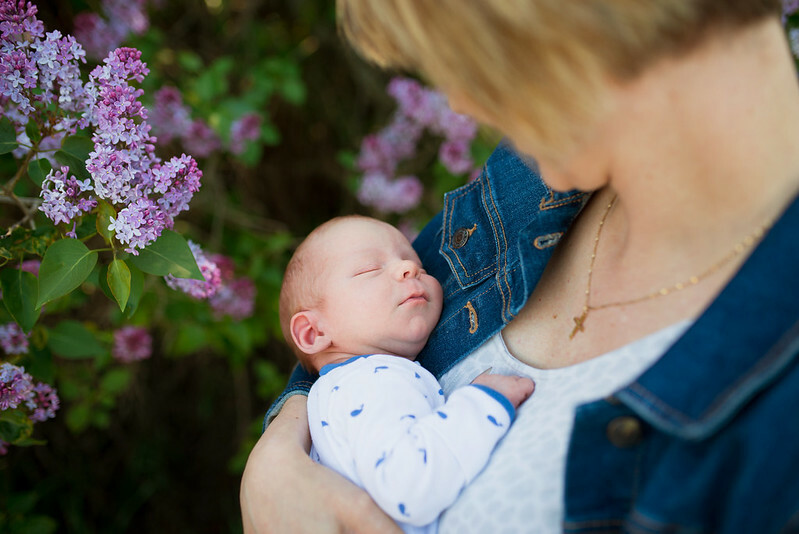 I used our DockATot with him then and, again, I vividly remember nursing him to sleep and carefully transferring him into the Dock and then having to pick up the entire Dock and bounce him gently until he REALLY was out. Then I’d have to gently put the Dock down and pray that he wouldn’t wake up. If he did, it was rinse, lather and repeat until he was settled and asleep. This process took anywhere from 45 minutes to 2 hours every night. I hated it. Are you exhausted reading that? I’m exhausted remembering it all. Those were red flags #2-10! Right then and there I told my mom that it was ridiculous and as soon as we got home I was sleep training him. He had 2 weeks in the helmet and had done well, now was the time or I was going to go insane. I truly didn’t have my hands free almost all day and I was touched-out. To be brutally honest, I was sick of having a baby on me all the live long day and I did NOT want our other kids to even sit near me to watch a show and I certainly didn’t want my husband near me; I had nothing more of me to give and the thought of being near another human made my skin crawl. I felt awful, and I knew it wasn’t my norm and that it wasn’t right. Luckily he sleep trained amazingly and I was able to have daytime freedom again. I joke about this, but I am also serious, that Jonathan keeps solidifying his position in the family as Baby for all eternity with how busy he keeps me. 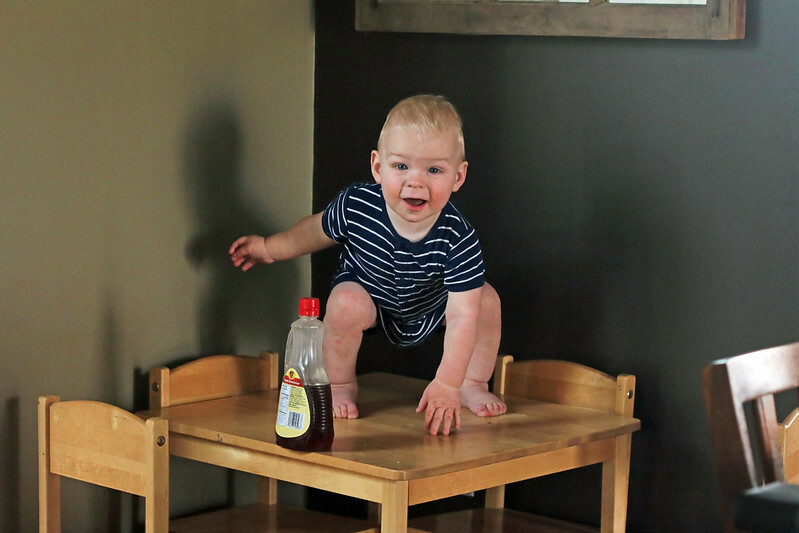 He climbs things, he gets into trouble, he makes messes, and he eats things he shouldn’t. Yes, he’s a toddler and that’s what toddlers do, but he is the busiest boy I’ve had and I’m not getting any younger! The DVD’s are all moved up 3 shelves so he can’t pull them down, open them up and take the discs and inserts out. We’ve done more baby-proofing than we ever have. He pulls all the books off his shelves and the diapers too if left alone for too long. He thinks the toilet is a water table and the toilet brush is a fun toy if I forget to shut our bedroom door that leads into the master bath. I’ll stop now, to spare you further disgusting examples! If I’m at home, at least I have home ice advantage, but if we’re out and about…I’m constantly toddler-proofing the area and shutting doors and putting away things and fishing things out of his mouth. It’s exhausting. (And did I mention I’m not getting any younger!?). My answer was: yes. When toying with the idea of having another baby I didn’t reeeeeeeeeeally want to be pregnant again. I REALLY didn’t want to do the whole labour and delivery thing again, especially how Ethan’s labour and delivery really messed with my head. But I knew at the end of it all, having that newborn baby in my arms again would be worth it all. We did have a semi-surprise pregnancy, followed by an early miscarriage, and that was when I absolutely knew that we needed another baby. I didn’t know for sure if it would be our last, but I knew we needed a third. Now when I ask myself that same question, I can confidently say with 100% sureness that we.are.DONE. A resounding NOPE, if you will. This time when I ask myself if I could skip the pregnancy and delivery and have a newborn in my arms, I’d still say no. I don’t want to hit rewind for the fourth time, I don’t miss the newborn stage, my ovaries don’t twinge when I see a pregnant belly or all the newborn photos that flood my newsfeed. I know now, without a doubt, God gave us our 3 boys and we were meant to be a family of 5. « Jonathan is 16 Months Old! Aww I'm glad that you found me and are enjoying reading! It will all come with time and someone on my Facebook page recently said that she read an article and had to realize that she was always going to long for a newborn, but didn't want anymore kids and *that* was okay for her.